You are currently browsing the tag archive for the ‘Alex Puccio’ tag. We’re putting the finishing touches on our new film The Players. 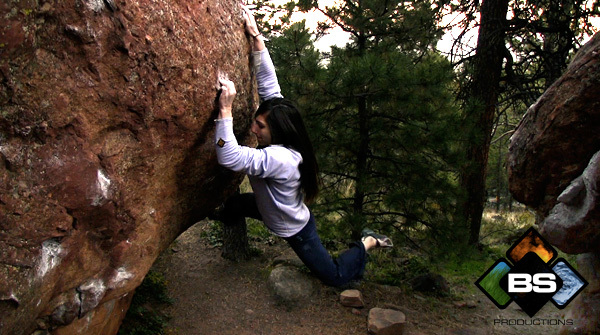 I’ve been working on Alex Puccio’s segment all day and am really psyched on how it’s coming together! Alex continues to forge her own way and push the standards of female bouldering. I shot her on the first female ascent of Trice V12 at Flagstaff Mountain, Co. Soon after, Alex headed down to Hueco Tanks in Texas for a short getaway. Our cameras were there to document this trip. Alex didn’t waste any time, giving really solid attempts at Slashface V13. Although she was unsuccessful this trip, she was able to do all the moves except for one. In only 30 min of working the problem! On the last day of the trip, Alex decided she wanted to return to Power of Silence V10. She had tried this problem during her last trip to Hueco and came pretty close. After numerous attempts, it all came together! Be sure to check out all the action in our new movie The Players, coming to DVD this May. Last week, we started shooting Alex Puccio’s segment for The Players. She’s been totally killing it, sending numerous V12’s in Colorado’s front range. One of those happened to be less than 5 minutes from Boulder. Trice is located on Flagstaff Mountain just outside of Boulder. We caught up with Alex last week to film her on the first female ascent of this problem! After a few attempts, she sent, making it look easy! Then, 10 minutes later, she sent it again for our cameras. Sick! We’ll be filming with Alex over the next few months as she continues to push the limits of women’s bouldering. Look for her segment of The Players, on tour and on DVD this spring!